« Who is going to start for Syracuse in 2012? Subscribe to comments with RSS or TrackBack to 'Ask Boswell 1/3/12 edition'. Be honest, Todd, didn’t you post that question to Boz demandeding he explain his dramatic shift between Dec 19 and Dec 21? I’m absurdly torn about the prospect of landing Prince Fielder. My heart really wants him batting cleanup for us next season, but my head understands the counter-argument that his contract would hamstring the team’s ability to sign players in the future. Mark Zuckerman wrote a good piece a few days ago about how, even without Fielder, the Nats payroll is going to increase dramatically in a few years time. He concedes that some (or even many) of our current players may not be around by 2015, but their projected salaries are nonetheless eye-opening. Honestly, besides the Yankees, how many teams have more than one or two players earning >$20M per year? If they signed Fielder and re-signed Zimmerman, the Nats would have three. I don’t buy the “Lerners are cheap” claim anymore, but I do have a hard time seeing them spending a combined $60M-$70M per year on three players. So, as much as I want Fielder, and as much as it would instantly help the team next season, I don’t believe we’ll sign him, and I’m not sure that’s a such bad thing over the long term. 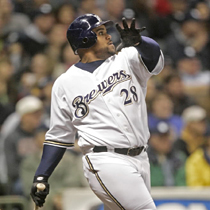 The only smart signing of Fielder to a lengthy contract that makes sense is an American League team. Fat people can still DH. It likely comes down to Fielder or Zimmerman for the Nats and I think most people will agree they’d rather have Zimmerman. Bourn is a better option than Upton. Buster Olney’s pros and cons are succinctly put. I saw someone else who said this point: “we don’t really KNOW what the payroll limit is on this team.” Believe it was Adam Kilgore. And its true; why are we assuming that the team “can’t” sign Zimmerman to an extension if we sign Fielder? Who is to say this isn’t an eventual $120M payroll? Detroit had about that level the past few years and they’re a smaller market and a less wealthy owner. Plus, payroll constraints are helped by good player development and by not spending money where you don’t have to … something the Yankees are learning the hard way. Instead of buying relievers for $10M/year, “grow” them from within for $450k/year. Wire Taps: Washington Nationals Links, Rumors – Prince Fielder, Yoenis Cespedes, Eric Chavez?- Hooyt!